There is plenty of talk going around about what Manuka honey can offer for people, but we aren’t the only ones who can benefit from the fairly recently discovered powerhouse honey. From the smallest of our pets to the wildest of animals, Manuka honey can be very effective, which one very lucky hedgehog can attest to. 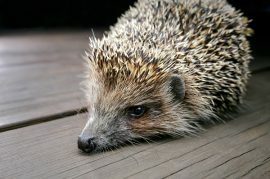 In Bridgwater, Somerset, England, several students in the Bridgwater College Academy—a mixed school for children between the ages of three to 16—saved an injured hedgehog in apparently “just the nick of time,” according to a wildlife rescue worker, upon discovering it on campus with plastic netting pieces wedged in its flesh. While on lunch break on the academy’s Quantock campus, the students found the poor hedgehog and immediately alerted the school faculty. A teacher cut much of the netting off the hedgehog before calling for assistance from the Secret World Wildlife Rescue, which is in East Huntspill, not too far from the school. From there, the little hedgehog was brought to the wildlife center for treatment, where it was immediately anaesthetized in order to remove even more netting from the animal’s neck, applying Manuka honey for helping to soothe the injuries. The procedure was successful, and there was no sign of infection to be found afterward. While being cared for and watched over by Secret World Wildlife Rescue, the hedgehog, who’s been christened with the name “Henry” by the kids, has recovered entirely and received a clean bill of health on June 14 by his vets. The plan is to release Henry back to the wild in the spot where he was initially discovered hurt, where he will hopefully pick back up where he left off without any issues. Curious about Manuka honey? To learn more about this type of honey or to get an order started, click here. And remember, we offer FREE shipping on all orders of $150 or more.